Born in Los Angeles to parents who had immigrated from Mexico and Switzerland, Mary Louise Tejeda Brown first studied art in high school with the Sisters of Saint Joseph of Carondelet, then commercial art at the Frank Wiggins Trade School in Los Angeles. She joined the Raymond Advertising Company in 1939, working as an artist and model. During World War II, she was employed in the art department of North American Aviation where she did illustrations for service manuals for the P-51 Mustang fighter and the B-25 bomber. She met her husband Reynold Brown there, also an artist. During the evenings, they worked together on aircraft drawings for Flying Magazine. Married in 1946, the couple moved to New York City in 1947, where he pursued a career as a free-lance illustrator. Mary Louise decided to put her career on hold so that she could dedicate her time to raising their eight children and helping her husband with his career. They returned to California in 1951, and Reynold made a name for himself as one of the premier illustrators of movie posters before focusing his career on fine art in 1970. 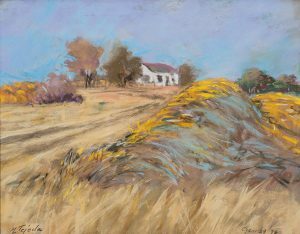 Her Nebraska Sketchbook series, scenes primarily from Dawes County, Nebraska, include 40 pastel works done rapidly on location in order to capture fleeting scenes. Ten larger landscapes, done over several days, are also part of the series. The Museum of Nebraska Art has seven works by Mary Louise Tejeda-Brown.